“The Singing Contractors” will be performing April 6 at 7 p.m. at Christian Academy School. The concert is being sponsored by Hardin United Methodist Church. 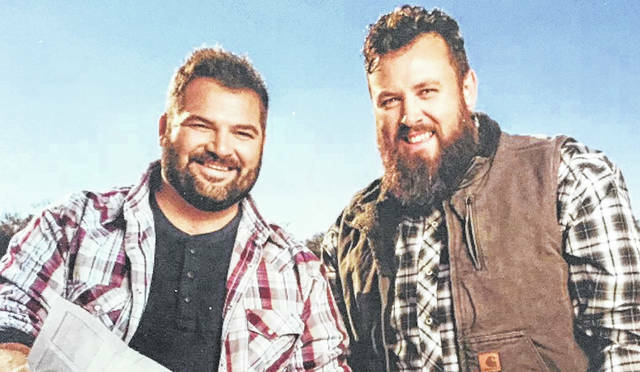 SIDNEY — Hardin United Methodist Church will be hosting “The Singing Contractors” in concert on Saturday, April 6. The concert will be held at Christian Academy Schools 2151 W. Russell Road, Sidney. “The Singing Contractors” swing their hammers and sing for Christ during their concerts. The foundation of the unlikely pair stems from a viral video of their poignant rendition of “ How Great Thou Art,” performed in an unfinished corner of a home remodel, which led to over 1 million views in almost 24 hours and an appearance on “Fox and Friends” morning TV show. The duo, comprised of Indiana natives Aaron Gray and Josh Arnett, has continued to amass a following due to their fun-loving personalities and compelling gospel covers. Growing up in singing families, hitting the road for weekend performances, Gray and Arnett are seasoned talents with strong work ethics, who are now building a national music platform in addition to houses. Tickets for the event are $5 each. For more information or to purchase tickets, call 937-726-0694 or 937-492-4595.
https://www.sidneydailynews.com/wp-content/uploads/sites/47/2019/03/web1_IMG_6025-2.jpg“The Singing Contractors” will be performing April 6 at 7 p.m. at Christian Academy School. The concert is being sponsored by Hardin United Methodist Church.